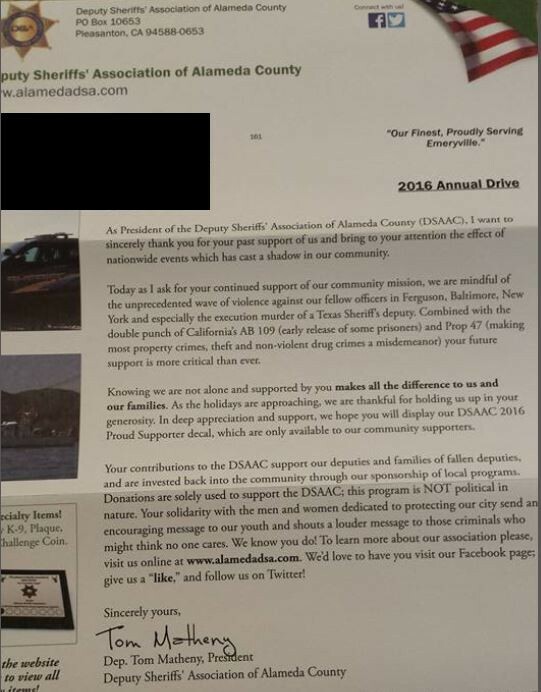 A fundraising letter from the Deputy Sheriff's Association of Alameda County. In a recently mailed fundraising letter for the Alameda County deputy sheriff's union, Deputy Sheriff Tom Matheny claimed that police officers are being threatened by an "unprecedented wave" of violence and assassinations. Matheny also wrote that two recent California laws aimed at reducing mass incarceration and decriminalizing nonviolent crimes have been a "double punch" against police and public safety. Neither claim is supported by facts. Official statistics show that police are safer on the job now than they have ever been. And experts studying the impacts of Prop 47 and AB 109 say it's too early to tell if they have caused noticeable increases in crime. The new laws have, however, reduced the prison population. "Today as I ask for your continued support of our community mission, we are mindful of the unprecedented wave of violence against our fellow officers in Ferguson, Baltimore, New York and especially the execution omurder of a Texs Sheriff's deputy. Combined with the double punch of Caliofrnia's AB 109 (early release of some prisoners) and Prop 47 (making most property crimes, theft and non-violent drug crimes a misdemeanor) your future support is more critical than ever." According to official law enforcement data collected by the FBI, the number of officers killed on the job has been dramatically dropping almost every year since the mid-1970s. Furthermore, the number of officers murdered while on the job is in fact at a historical low point. Even the most recent numbers collected by law enforcement groups like the Alameda County Depurty Sheriff's Association show that few cops are being killed in the line of duty. "According to data available from the 'Officer Down Memorial Page' on the annual number of non-accidental, firearm-related police fatalities, 2015 is on track to be the safest year for law enforcement in the US since 1887 (except for a slightly safer year in 2013), more than 125 years ago (see top chart above). And adjusted for the country’s growing population, the years 2013 and 2015 will be the two safest years for police in US history (see bottom chart above), measured by the annual number of firearm-related police fatalities per 1 million people." According to the Officer Down Memorial Page for the Alameda County Sheriff, the last ACSO deputy killed in the line of duty was Deputy Sheriff John Paul Monego. Monego was shot and killed in 1998. Since 1898, nine Alameda County sheriff's deputies have been killed. As for the impact of AB 109 and Prop 47, most experts say it's too early to tell if either law is causing an uptick in crime. For example, as Sam Levin wrote in a recent issue of the Express, many of the people claiming that Prop 47 is causing a crime spike have failed to include any credible evidence or data linking the ballot measure to crime trends. UC Berkeley criminologist Barry Krisberg told Levin that police departments simply don't have enough data yet to determine whether or not the policy correlates to crime patterns. Representatives from the Alameda County Deputy Sheriff's Association did not immediately return a phone call seeking comment on the unsubstantiated claims in Matheny's fundraising letter.